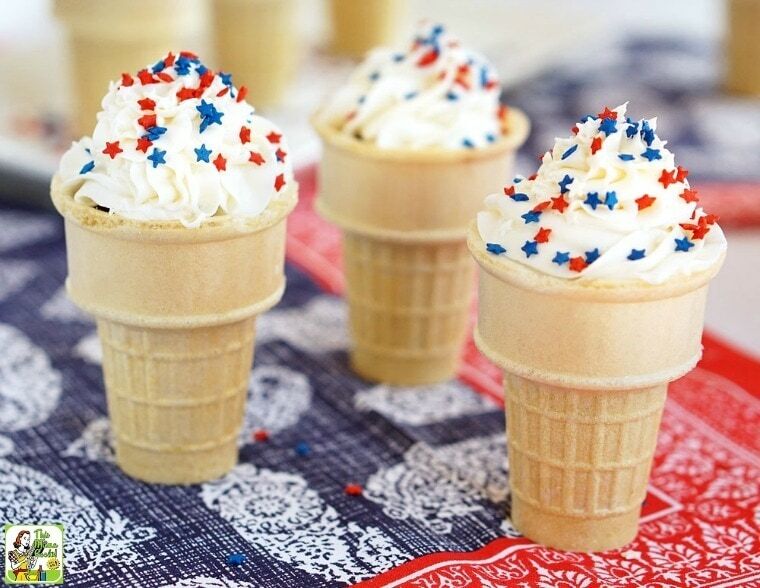 Summer is the perfect time of year to make these ice cream cones cupcakes. That’s because they don’t melt when it's hot out, since the “ice cream” is really frosting! Also, anyone at your next bbq or pool party can enjoy indulging in an ice cream cone cupcake since they’re gluten free. But no one needs to know that, except your gluten free guests of course! That’s because they’re delicious and super fun to eat! 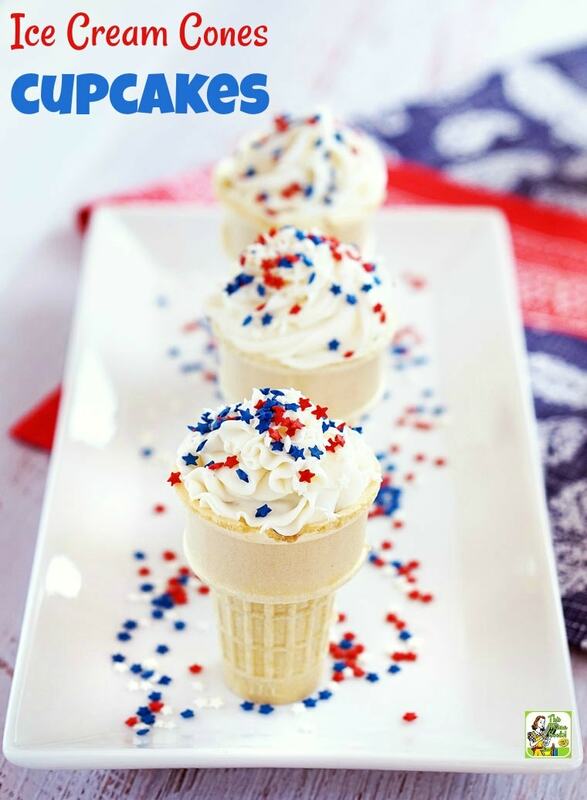 Would you like to learn how to make ice cream cone cupcakes for your next cookout or Fourth of July party? It’s easier than you think! 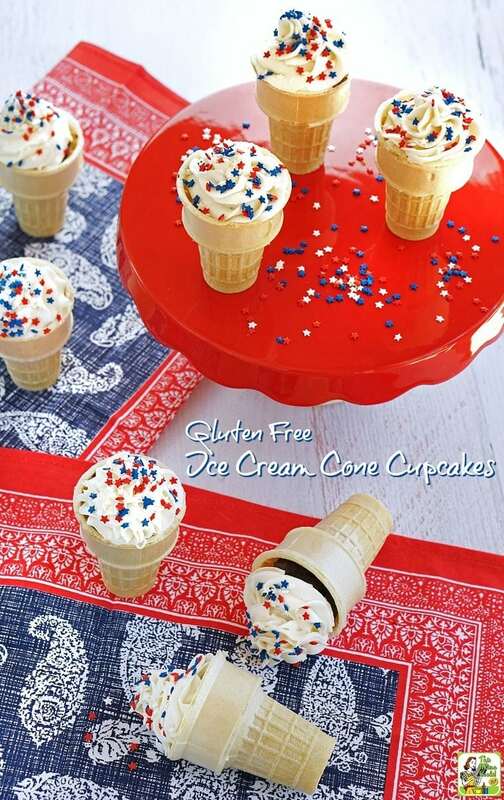 Wondering how to make ice cream cone cupcakes that are gluten free – and that still taste yummy? Luckily, Joy Cone Co. makes gluten free ice cream cones! There make two types of gluten free ice cream cones that you can bake cupcakes in: gluten free sugar cones (the hard kind with the pointy end) and gluten free ice cream cup cones (the softer cone with the flat bottom). These were the gluten free ice cream cones I used. You can also try Goldbaum's Gluten Free Ice Cream Sugar Cones. If organic food is your thing, check out Let's Do Organic Gluten Free Ice Cream Cup Cones. It’s wonderful to see so many gluten free ice cream cone choices out there! For the cupcake in the ice cream cones, use your favorite gluten free cake mix and frostings. I like both Betty Crocker Gluten Free Devil's Food Cake Mix and Pillsbury and Pillsbury Gluten Free Devil's Food Premium Cake Mix. I personally like the contrast of chocolate cake with the yellow cones and white frosting. But you can use Pillsbury Funfetti Gluten Free Premium Cake & Cupcake Mix with Candy Bits or Betty Crocker Gluten Free Yellow Cake Mix instead. Totally up to you! I used Pillsbury Creamy Supreme Vanilla Frosting. It’s my favorite store bought frosting as it’s easy to pipe and tasty. Also, all Pillsbury frostings are gluten free, so you certainly can use a different color or flavor in your ice cream cone cupcakes. Finally, check the ingredients list on the type of sprinkles you use, to make sure they’re gluten free, too! I used Dress My Cupcake Decorating Edible Cake and Cookie Confetti Sprinkles. You can use any color combination you like. I like red, white and blue for Memorial and Labor Day and Fourth of July. During the fall, use your team’s colors for tailgate parties. Think you’ll make ice cream cones cupcakes often? Then get an ice cream cone cupcake holder! I bought the Betty Crocker Ice Cream Cone Cupcake Baking Rack. It worked great for the gluten free ice cream cup cones. Unfortunately, the gluten free ice cream sugar cones were too long for this rack. I had to prop the sides of the ice cream cone cupcake holder over a baking casserole pan to get enough height when baking. So, I recommend getting a Wilton Cupcake Cone Baking Rack as it can be used with both gluten free sugar cones and gluten free ice cream cup cones. It’s also a more attractive ice cream cone cupcake holder for serving your cupcakes. You can also make your own ice cream cone cupcake holder pan. Here’s a tutorial. When putting the batter in the cones, fill up the cup cones 2/3 of the way and the sugar cones 1/2 of the way. Since I chose to serve my sugar cones flat and not in a rack, this gave me enough room inside the ice cream cone for plenty of frosting and sprinkles! If you like, place a real maraschino cherry on top. If you’re bringing these ice cream cone cupcakes to a potluck, add the cherries just before serving. One box of cupcake mix made 24 cones and 5 extra cupcakes. Make sure you have enough sprinkles, frosting, and cherries! You may notice that your ice cream cones are soggy after baking. Bake the ice cream cones cupcakes the night before. Then place them in a 350 degree oven for 4-5 minutes. Let cool, then decorate. To make the ice cream frosting swirl, use large Wilton 2D and 2C tips. Turn oven on to temperature recommended on your cake mix box. 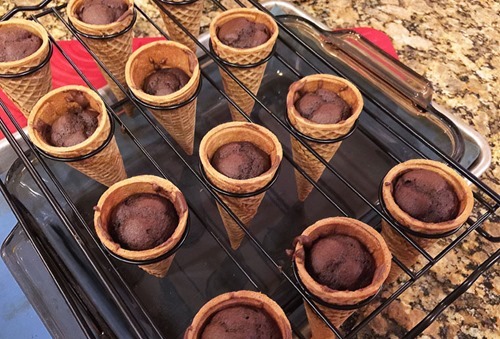 Place cones in an oven safe ice cream cone cupcake holder. Fill each cone from 1/2 to 2/3 full of cake batter. Bake at time and temperature recommended for cupcakes on your box mix. After ice cream cone cupcakes have cooled, frost with your gluten free canned frosting using a large piping tip. Decorate with sprinkles. 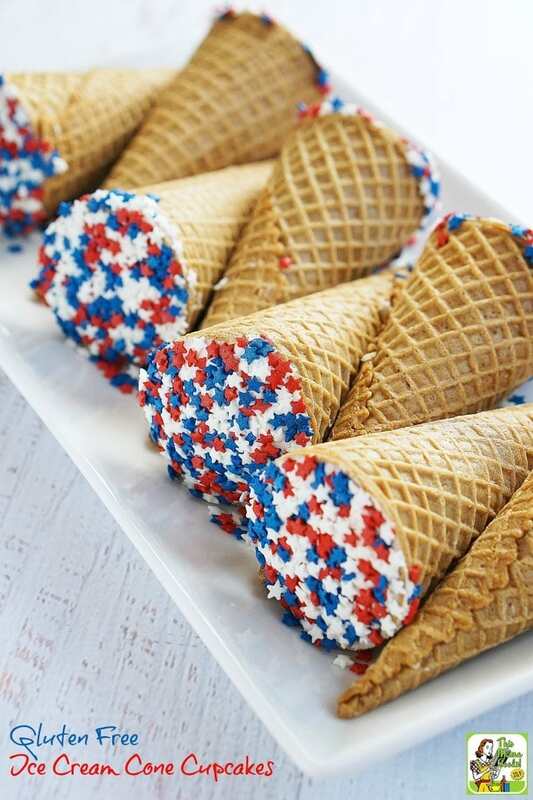 For sugar cones, if you don’t have a rack for serving them upright, use a small amount of frosting to fill cone. Then gently pat top of cone into sprinkles. That way they can be placed flat easily. Leftover batter can be baked in regular cupcake liners. Decorate them with leftover frosting and sprinkles as a special treat for the chef and his or her helpers! Originally published on June 29, 2016 and August 6, 2017. Posted in Baking, Desserts, Gluten Free, Recipes and tagged cupcakes, party food on June 20, 2018 by Anne-Marie Nichols.